A panini is just a glorified grilled cheese sandwich filled with any combination of cheeses, meats, and/or vegetables…crunchy on the outside, oozing with melted cheese on the inside. Yumm! Paninis are usually made with a panini press (electric or stove-top). Just cook the sandwich in a pan on both sides until golden. Serve with mixed greens and you’ve got an easy meal in minutes. 1) In a small saucepan over medium heat, warm the olive oil. Add the rosemary and fry until just fragrant, about 20 seconds. Remove from the heat and let cool. 2) Preheat an electric panini maker according to the manufacturer’s instructions. 3) Brush one side of each bread slice lightly with the rosemary oil. Lay a bread slice, oiled side down, and arrange the salami and cheese on the bread. Add the bell peppers and top with the other bread slice, oiled side up. 4) Place the sandwich on the preheated panini maker and cook according to the manufacturer’s instructions until the sandwich is hot throughout, golden and crispy. 5) Transfer the sandwich to a cutting board and cut in half. Serve immediately. 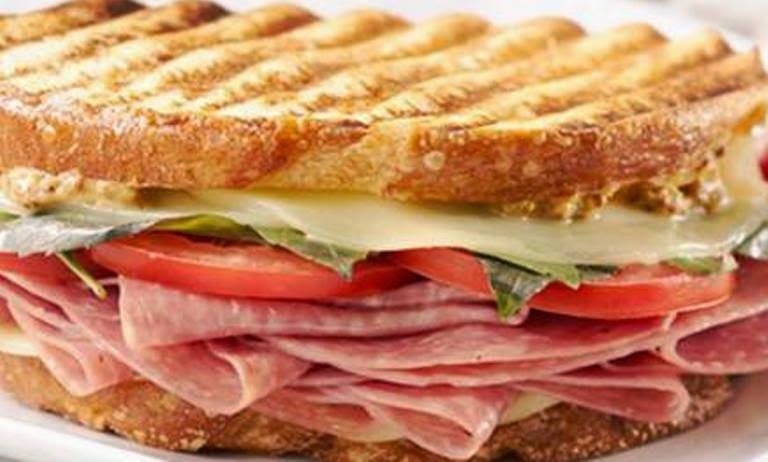 Note: There are countless combinations of delicious fillings for panini. For a vegetarian version, try grilled eggplant, fresh mozzarella cheese and arugula. Serves 1 sandwich. I can safely say i wish i was eating this right now, its looks absolutely delicious, great post thanks so much for sharing.